Oxford Street has more than 300 shops, I’m not sure how many there are on Kalverstraat. Never-the-less there are many shops which you can find at least one of on both streets including: River Island, Zara, H&M, Esprit, Mexx, Morgan, Miss Sixty, O’Neill, Nike, Foot Locker, Waterstones and stinking old Lush. Although this sounds like good news for an English girl in a foreign land, the Amsterdam versions of the shops are normally tiny in comparison to the size of the London ones. Oxford Street follows the route of a Roman road which linked Hampshire with Colchester and became one of the major routes in and out of London. The oldest documented reference to ‘die Calverstraete’ dates from the January 1393. The name “Klaverstraat” refers to the previous trading in cows, oxen and calves which took place in the street until 1629. After the disappearance of the cattle-market, the Kalverstraat turned into a shopping street with broader appeal. Amazingly most of the shops on the Kalverstraat are open on Sundays, which is very unusual for Holland. During the week they all close at 6pm, except on Thursdays for late night shopping until 10pm. Most Oxford Street shops are open on Sundays too, and John Lewis opens at 11:30 for browsing until you’re legally allowed to buy things at 12noon. Most shops on Oxford Street are open until 8pm during the week and later on Thursdays. Kalverstraat is the equivalent of Mayfair on the Monopoly board, making it sound far more upmarket than it actually is. Oxford Street is part of the green set of streets on the British Monopoly board together with Regent Street and Bond Street. In Holland the green streets are represented by streets in Rotterdam, presumably because there are not enough interesting Amsterdam streets to fill an entire board (god knows what they do about getting hold of four famous stations). Both streets have live webcams. The Kalverstraat one updates freakishly often – it’s almost like live TV (big brother strikes again). The Oxford Street webcam is provided by Transport for London and is normally not working. These are two men which can’t physically be in the same room together at the same time, a bit like Clark Kent and Superman, or more like Father Christmas and Sinterklaas. They’ve got much more in common than just their initials, which are the same but reversed, to put you off the suspicion that they are genetically (or financially) linked. 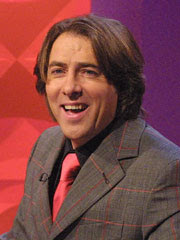 Friday Night with Jonathan Ross – doesn’t have an official website! They have the same floppy hairstyle and have never-ending wardrobes of garishly bright clothes. They both laugh at their own jokes. Both men can be counted on to appear in mini adverts for their own shows in the gaps between the four shows preceding theirs. This is just a really short post remarking on the hilarious, but slightly disturbing, likeness between some Dutch ambulances and the Ghostbusters van. I saw this for the first time last weekend, when venturing into the south of the country. When I worked at a large office in the Netherlands the only hot food served in the canteen was deep fried, everything else was (of course) bread or cheese. Here, I saw many Dutch colleagues eating deep-fried croquettes mashed up and spread in a bread bun. This seems far from a healthy balanced meal and more like a carb overdose to me. Not being particularly fond of meat slurry, I’ve only dared to eat Bitterballen and Patat. Bitterballen are served with a small ramekin of mustard and Patat (frites) are smothered with mayonnaise. There is a whole fast-food retail concept “FEBO” focusing on just these sorts of vein-cloggers. The name FEBO comes from the street where the first ever shop was located, on the Ferdinand Bolstraat round the corner from where I live in Amsterdam. Now common all over the country, each establishment is nothing more than a couple of guys with deep fryers and a wall with rows of coin-operated vending doors. Behind the doors a range of soggy looking burgers and croquettes await. Drunk Dutch boys will sometimes attempt to eat a “straatje” (street) which means opening a whole row of the little doors of doom and consuming the contents within. Calorie-wise, I’m sure this idea knocks the typical “English” donner kebab into touch, and that was always rumoured to be the equivalent of your daily calorie allowance in one go. 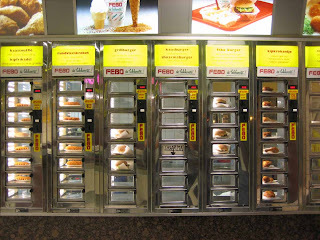 As far as I know FEBO is unique to Holland, surprisingly the concept has not been exported. The Dutch are very particular about the way of dressing their chips (patats) and you need to be in with their lingo to make a successful order. If you just want salt, ask for “patat zonder”, chips with salt and mayonnaise are “patat met”. You can also get “patatje oorlog” (chip battle) which is the last chips from the pan drenched in pretty much every sauce available (peanut sauce, mayo, curry sauce, ketchup and chopped raw onions). This is probably the only way you’ll be able to get chips with ketchup in Holland without being criticised, but all the other throat burners come with it too. 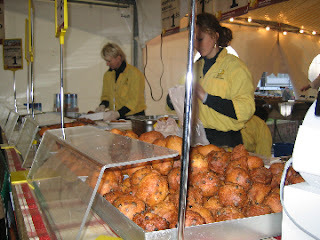 One last treat worth a mention is Oliebollen (literal translation: Oil balls). These sweet deep-fried pastries are similar to donuts, but roughly spherical and with raisins, currants and sultanas added to the batter. They are most delicious when served hot and with powdered sugar on top. Oliebollen are only available to buy at and around New Year, when Oliebollaries (decorated sales huts) appear all around the city wafting the smell of their freshly fried Oliebollen. We’ve made our own fresh Oliebollen on New Years Eve for the past three years in a row, they were really lekker (yummy) but not at all ball-shaped. I realise that my last two posts about my life in Amsterdam were a bit on the negative side. I feel bad about that as generally I'm really enjoying living in Holland, and this captial city is beautiful. So, to even things out a bit, here is a Top 10 list of list that I love about living in Amsterdam. Amsterdam has the most beautiful lines of canal houses. To me they all look like dolls houses, with lots of big windows, different coloured brickwork, and beautiful gables. Because all these building are built on swamp they have long wooden stakes as foundations which are supposed to hold them upright. But given centuries of earth settlement many of the houses now lean incredibly, either against each other, or more startlingly into the street. Dutch bars and cafes, much like those in Italy, love making the most of their wide streets and squares by casting their outdoor furniture into the sun. In Amsterdam this appears to happen in March, as soon as the first glimmer of sunshine pokes through the clouds. Once it's warm enough to sit there without your winter coat on it's one of the most relaxing ways to enjoy an evening, glass of Rose or Biertje in hand. This is no exaggeration. The Dutch grow flowers for export, but they must sell almost as many at home. Every single street will have at least one florist, bloemenwinkel or bloemenkunst. One single 100m stretch of street around the corner from where I live has 3 huge florists, and a flower stall. 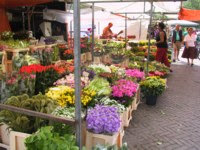 Then of course there's the actual flower market in town, which is a line of about 20 big stalls along a canal. All this flower trading makes for even prettier streets, and means that both my husband and I are more likely to buy flowers for the house. Tonight I will get nearly an hour of extra sunshine because I live in Amsterdam rather than London. The sun sets at 21:43 local time in Amsterdam, and 20:53 local time in London. This is because The Netherlands is almost as west as you can get within the Central European Time zone, and then if you cross a few kilometres into England you're in the Greenwich zone. 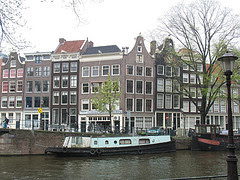 There are more canals in Amsterdam than in the whole of Venice, and in my opinion the Dutch ones are much prettier. I'd love to buy a little canal boat for put-putting away sunny afternoons with a picnick and drinks. For the moment though, I love just being able to walk over the pretty bridges and take in deep breathes of that great canal water air. It's almost as good as being by the sea. Seriously! The Dutch don't realise how lucky they are with this one. I think, in a way, they look down on the rest of the world for not cycling. But, the fact that the country is completely and utterly flat makes for the easiest cycling tracks in the world. There's almost no need for gears here. 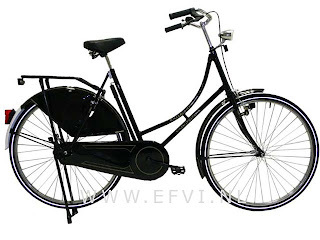 My "Omafiets" (see picture) has three gears, but I rarely use them, except if I'm trying to conquer a big canal bridge! Cycling here is not challenging, it's relaxing, cheap and quick. It's the best way of getting across Amsterdam, that is if it's not raining. It's incredibly offensive to serve coffee or tea in Holland without a "koekje erbij". This means that every warm drink you receive comes with some sort of small biscuit or cookie (the word cookie actually comes from the Dutch koekje, meaning "little cake"). Usually the biscuits are based on Speculaas (ginger biscuit) but once in a while you'll get a mini-stroopwafel. 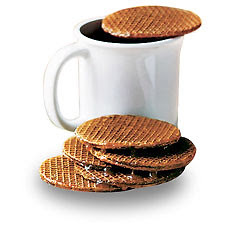 Stroopwafels can be found in Starbucks in other countries, but they come from Holland. The full-sized version is designed to fit over the top of your coffee cup so that the caramel inside melts. I actually hate caramel, except for in Stroopwafels. You can buy freshly made stroopwafels from a stall in the middle of the Albert Cuypmarkt (market) in Amsterdam. This is a brilliant invention and should be replicated in all large cities around the world. My husband and I are subscribed to Greenwheels. We pay a flat subscription fee of about 12 euros a month and then we pay per hour and kilometre that we use the car. There are greenwheels cars all around our neighbourhood in Amsterdam, the closest is about 80 metres away. All the cars are brand new - the company just replaced the fleet with the car that generates the least CO2 emissions, the Peugeot 107. 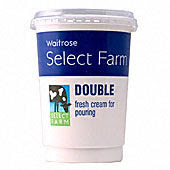 Not only does this scheme save the environment, but it saves us a fortune too. We don't own a car now, so we don't have to pay for car insurance, parking permits, petrol, MOTs or any of those things which back in England were a real drain on cash. Albert Heijn (AH) classify their size of store from 1-5 (1 being the smallest, 5 being the biggest). The store nearest me is categorised as a size 4, so you’d expect it to be pretty big and stock pretty much everything you’d need or want. Not so. No Lamb of any variety: no minced lamb, diced lamb, lamb steak, lamb chops. Nothing. Amsterdam is full of Turks, you’d think they would want to buy some lamb? Oh I forgot, everyone in Holland has the time to traipse around the butchers, bakers and candlestick maker’s shops every single day to get their groceries. My Albert Heijn always stock lemons, oranges, mangoes and pomegranates, but no limes. I don’t understand what kids drink here. Parents have the option of buying either really expensive fruit juices, or carbonated drinks for their kids. The other option, which I wouldn’t go near, is something like the French Diablo, which the Dutch call Sirop, and is pure sugar in a tin. I guess they just rely on good old fashion milk, and chocolate milk (also full of sugar). I was truly astounded at this one. Procter and Gamble what are you doing to me? 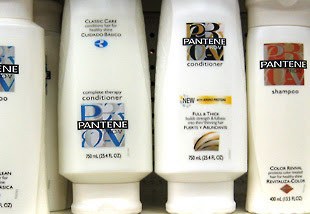 The hair product aisle in my category 4 Albert Heijn is four shelves high by about 8 products wide and includes L’Oreal, Dove and something called Andrélon (made by Unilever) which dominates the shelf in garish purple packaging. Compare this to the hair product range in my old Tesco in London which was about 10 metres wide and had every product under the sun, except Andrélon. First, it’s impossible to by a box of cereal over 500g. It’s like buying mini cereal boxes from a Kellog’s selection pack. I need to buy two boxes to last the week. And talking of selection, don’t get me started on the range of cereals available in Holland. The narrow shelf here has Fruit and Fibre, “Cruseli”, Jordans Muesli (pronounced in the not-so Biggleswade/Bedfordshire accent of “Yoordaans”), Cornflakes, Special K and something based on sawdust. Weetabix, if available, only comes in boxes of 12 – that would last one person only six days – does everyone in Holland live alone? Maybe it’s just me. Maybe I’ve been completely spoiled by the British half-wit attempt at good customer service, or maybe, just maybe, I’m not the only one that gets into a semi-panic every time I want to pack and pay for my grocery items at the Dutch supermarket Albert Heijn (AH). In reality, everything about the queuing system here is wrong, annoying or just down-right rude. I’m told by my family here in Holland that if there are more than three people in a queue then good old AH promise they will open another till. I had hoped that this would be comparable to Tesco’s ‘One in Front’ campaign that successfully minimises waiting time for customers. 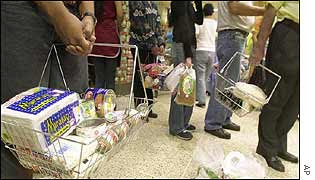 But arrive at an Albert Heijn in the early evening and of the miserable five cash tills available only two will be open. There will, therefore, be lengthy queues at both – we’re talking seven or eight people. It turns out that the ‘Three in a line’ idea is a Dutch customer service fable. Once in a blue moon, by some stroke of luck, one of the staff suddenly notices that they haven’t actually been doing anything useful for the last ten minutes and that they could help out by opening a till. Then, it seems, the people in the queue have no concept at all of ‘first come first served’ and instead it’s normally the tallest, youngest or fittest person that ends up the first at the newly opened till. This surprised me. The Dutch are normally such an overly-fair, almost socialist nation, but in queuing situations it’s everyman for himself. My queuing experience normally goes something like this…. After about 15 minutes of queuing like a sheep, I finally reach the front and it’s my turn. It’s then I think to myself that I better set my stop watch for the time trial I’m about to face. The cashiers here have zero empathy with their customers, none what-so-ever. Maybe they think that because I’m so fed up queuing that I’m now so desperate to leave the shop that I now possess the super-human capability to pack my items at light speed. So they zap each item passed the scanner and my shopping passes down my slim half of the partitioned conveyor belt to the end. Then the next item quickly follows, then the next, the next, the next, the next. Until I’ve got such a big pile of shopping in front of me that the most recently scanned items are squashing the first items, to the extent that I can’t actually pack the first items anymore because they are so tightly jammed together. So much for my time-tested strategy of trying to pack the heavier, more resilient, items first. Instead I’m forced to pack the tomatoes, crisps and lettuces first, at the bottom of my bag, just because they are the only things free enough to physically remove from the pile. Not only are my items squashed under their own weight, now the cashier needs to make room for the next persons shopping so she forces, shoves, pushes and wrenches the separating arm dividing the narrow conveyor belt against my shopping, packing it in even tighter. Push, shove, it won’t go, but she continues to zap and zip those items through regardless. The conveyor belt whizzes my neighbors’ shopping downhill, simultaneously forcing my shopping tighter and tighter against the end of the till too. When I finally manage to separate my groceries from each other and pack them haphazardly into bags I’m exhausted, wishing never to return again. I normally leave muttering complaints and suggestions semi-loudly under my breath as I pass by the two idle AH staff sitting around at the cigarette and newspaper counter positioned near the exit. It’s not that Albert Heijn is cheaper than the competition, it’s actually one of the more expensive supermarkets in Holland. So where does all the money go? They are obviously not investing in capable staff, or training, or logistical systems to help with their poor customer service. Tesco’s even go as far as to employ heat seeking cameras, which sense the number of customers entering a store and predict the checkouts that need to be open in an hour. If Albert Heijn were to do this I think the results would be skewed by the heat coming off the customers leaving the store in a sweat.